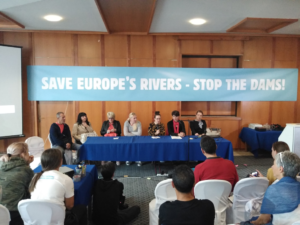 In October of 2018, I had the good fortune to travel to Eastern Europe’s Balkan countries to attend the first ever “European Rivers Summit,” whose main convener was the European NGO, Riverwatch. I also met with and joined the team at “Balkan Rivers Defence” on one of their river trips along their month-long tour of the pristine rivers facing dam threats in Eastern Europe. 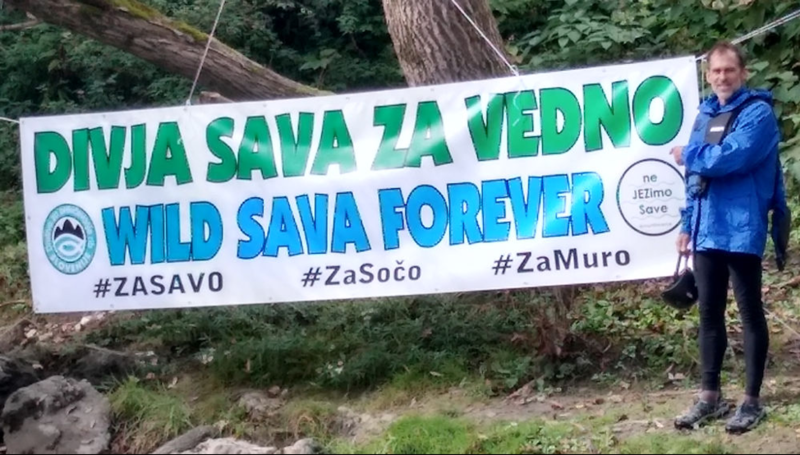 The Summit, in Sarajevo, Bosnia, and Herzegovina, brought together 250 river protectors across Europe. 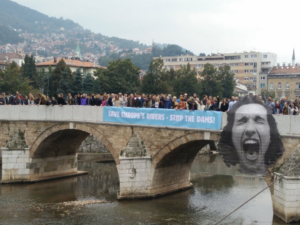 As a part of the 3-day Summit, we all joined in a civil celebration to “Save Europe’s Rivers – Stop The Dams” on a bridge over the Miljacka River in downtown Sarajevo (above). Nearly 3,000 hydropower dams are planned on the rivers in the Balkan countries, a threat that has sent shock waves across communities and environmental NGOs in Europe. One of the most compelling stories told during the Summit was about the dam fight on the Kruscica River in Bosnia and Herzegovina. The story is highlighted in the new film, “The Blue Heart,” created by Patagonia. The dam fighters—mostly a group of women trying to protect their community, families, and drinking water—have been blocking a road to the dam site for nearly one year. The blockade, which at times has faced violent opposition, has been organized in around-the-clock shifts. During the Summit, a few of the leaders of the blockade took a day off to come to Sarajevo to visit with the Summit attendees. The “Brave Women of Kruscica,” as they are becoming known in Europe, told us their stories (above). I attended the conference on behalf of the global environmental organization Waterkeeper Alliance to introduce the Alliance’s new “Free Flowing Rivers Initiative” to the European audience. 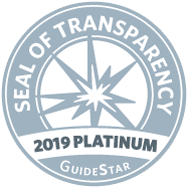 Waterkeeper Alliance is working to protect waterways and fight dams across the planet by providing support and services to local organizations engaged in battles. If a group joins Waterkeeper Alliance, we offer a variety of support including trainings on how to administer a small NGO, how to raise money, how to communicate with the media, connections to legal services, among other assistance. My presentation (above) was well attended and accepted. The final day of the Summit included a big outdoor concert in downtown Sarajevo. The evening was chilly, but that didn’t stop hundreds of Summiteers, as well as many Sarajevans, who partied into the evening. 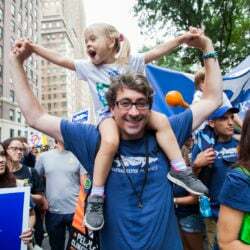 The event began with a number of speakers, including Summit organizer and renowned European environmentalist, Ulrich Eichelmann, who is CEO of RiverWatch. 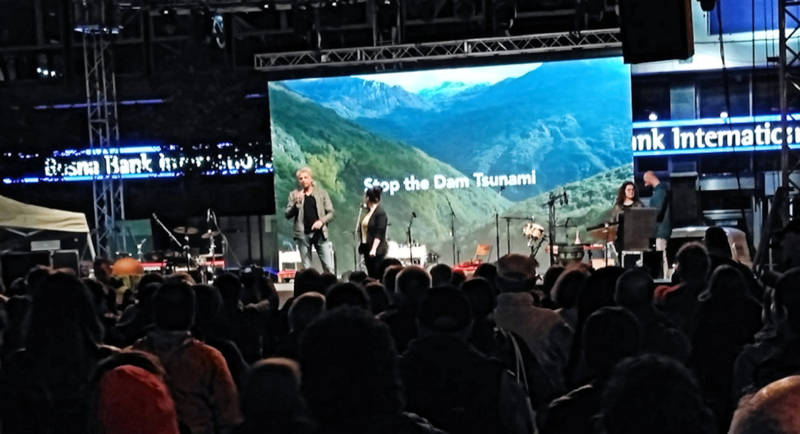 “Stop The Dam Tsunami” was blazoned across the Jumbotron as Ulrich spoke (above). 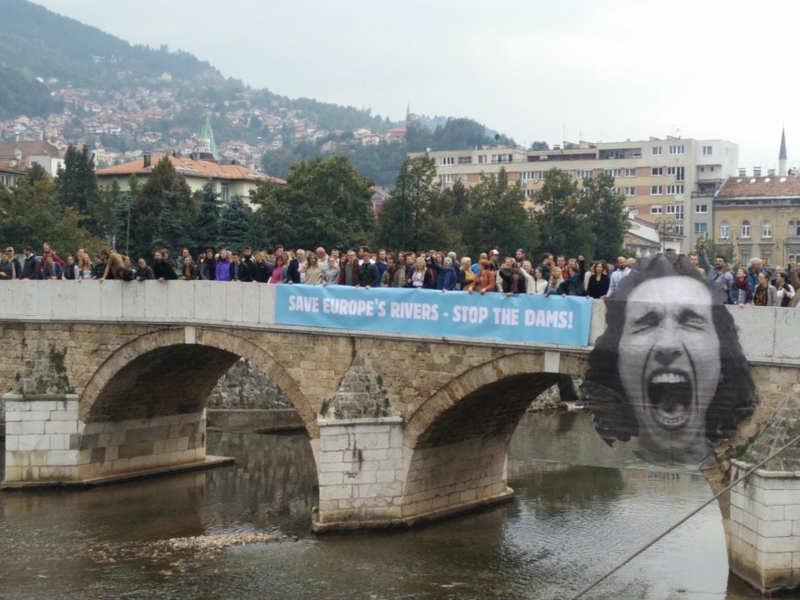 Before and after the Summit, a parallel adventure-protest was convened by “Balkan Rivers Defence.” For the third year in a row, their team of raconteurs toured 16 rivers facing dam threats in the Balkan countries—Albania, Macedonia, Montenegro, Bosnia and Herzegovina, Croatia, and Slovenia (see the tour schedule here)—and joined up with the Summit in Sarajevo. Several days later, I met up with the Balkan Rivers Defence team in Ljubljana, Slovenia, at their second-to-last tour stop on the Sava River which is also facing dam threats. Balkan Rivers Defence is founded and led by Rok Rozman, a former Slovenian Olympian kayaker, who is filled with vim and vigor to protect rivers. Fist and paddle in the air, megaphone in hand, Rok (above) is leading the charge of this authentic, grassroots, dam-fighting movement in the Balkan countries. 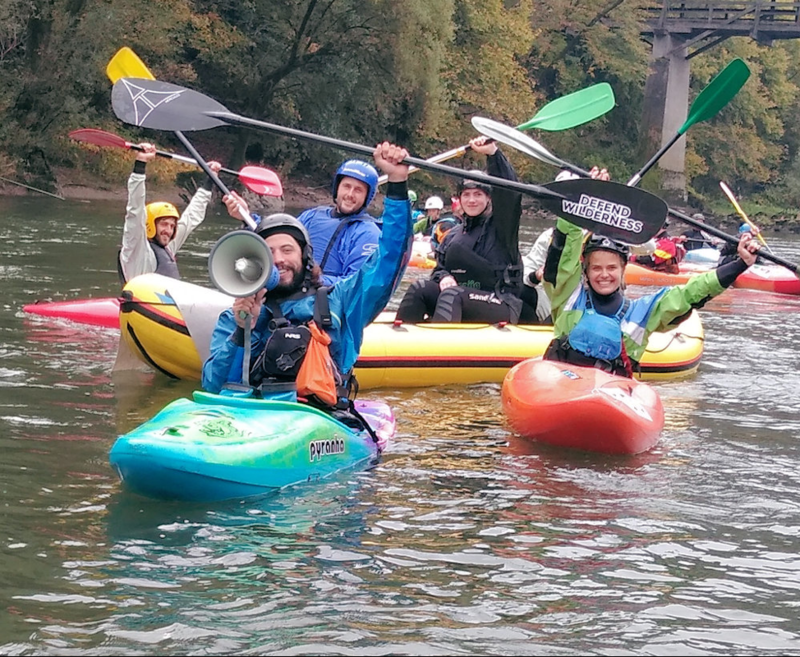 The Sava River segment of the Balkan Rivers Defence tour had about 50 boats filled with chanting paddlers. 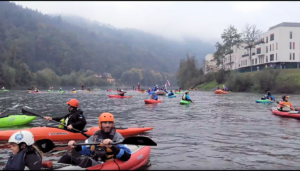 We started in the town of Litija and slowly floated downstream to Zagorje ob Savi. 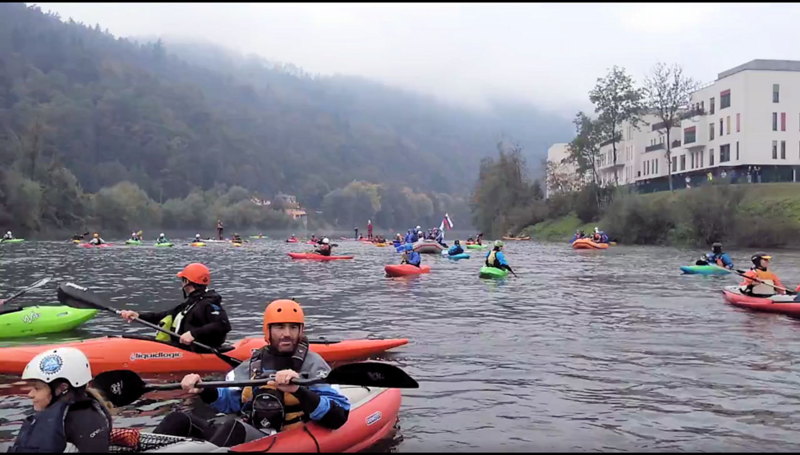 The river had a few small rapids which tickled the kayakers, but we mostly floated, chatted, and chanted about the battle and adventure of trying to save rivers across Eastern Europe. 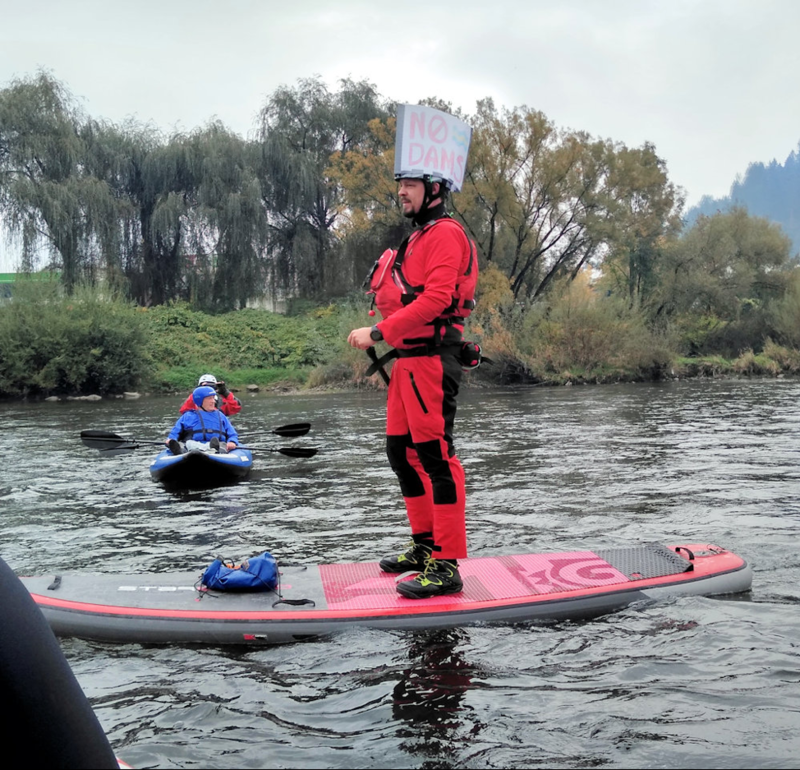 The Sava River trip included a few costumed protestors. At the takeout, more photos were taken as music played and the celebration ramped up. I stood beside the “Wild Sava Forever” banner for a photo-op. Balkan Rivers Defence had a huge event the last night in Ljubljana, Slovenia (above). 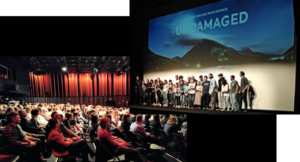 More than 500 people packed into a sold-out concert hall to see the new film, “Undamaged,” which chronicles the Balkan River Defence Tour the previous year. 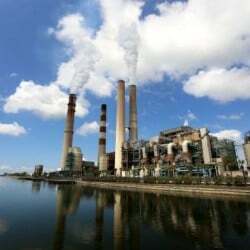 The film will begin screenings at global environmental film festivals in the coming year. The event was capped off with a concert. Make sure to check out Undamaged if it comes to a film festival in your town. 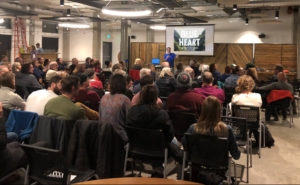 A few days later, I was back home in Fort Collins, Colorado, in the U.S., where I had arranged a screening of “The Blue Heart” for our local Waterkeeper Organization, Poudre Waterkeeper (above). Like our European counterparts, we fight proposed new dams and work to protect and restore the Cache la Poudre River of northern Colorado. We had more than 100 attendees and everyone enjoyed the film and its passionate story about saving the amazing rivers of Eastern Europe. 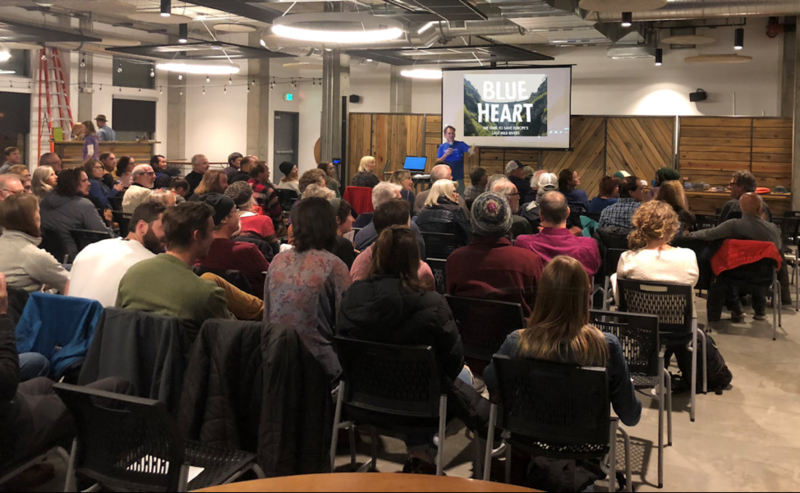 River-protection groups can arrange a screening of “The Blue Heart” anywhere in the world. Visit Patagonia’s webpage, click “See The Film,” and then “Host A Screening” to bring the film to your community. 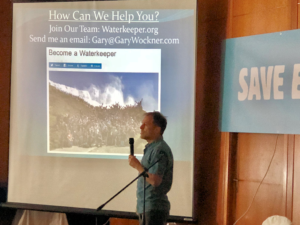 Gary Wockner, PhD, is on the board of directors of the global Waterkeeper Alliance as well as the Poudre Waterkeeper in Colorado. 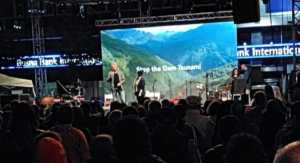 He travels frequently around the world sharing the Waterkeeper message and highlighting threats to rivers and waterways wherever they occur. 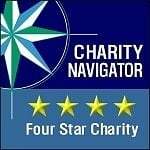 More information: GaryWockner.com. Contact: [email protected].